This short course will offer historical and contemporary perspectives on a variety of social justice movements. 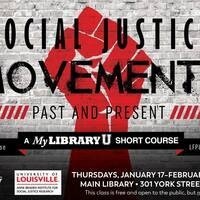 Six scholars from the U of L Anne Braden Institute for Social Justice Research, Muhammad Ali Institute for Peace and Justice, and University of Kentucky will explore aspects of social movement-building on topics such as racial justice, youth-led immigrant justice, LGBTQ rights, solidarity, and more. Scholars include Lara Kelland (UofL History/Comparative Humanities), Cate Fosl (UofL Women & Gender Studies, Director of Anne Braden Institute), Ryan Combs (UofL School of Public Health & Information Sciences), Karen Tice (UK Gender and Woman's Studies), Cherie Dawson-Edwards (UofL Criminal Justice), and Enid Trucio-Haynes (UofL School of Law). The class is free and open to the public, but registration is requested. Call (502) 574-1623 to reserve your spot.